The SHARC molecular dynamics (MD) program suite is an ab initio MD software package developed to study the excited-state dynamics of molecules. can treat non-adiabatic couplings at conical intersections, intersystem crossing induced by spin-orbit coupling, and laser couplings on an equal footing. can treat any number of states of arbitrary multiplicities. has interfaces to MOLPRO, MOLCAS, COLUMBUS, ADF, TURBOMOLE (only ricc2), GAUSSIAN, analytical potentials, and linear-vibronic coupling potentials. comes with the WFoverlap program for efficient computation of nonadiabatic couplings and Dyson norms. can do on-the-fly wave function analysis through TheoDORE. includes auxiliary Python scripts for setup, maintenance and analysis of ensembles of trajectories. includes scripts to perform excited-state (crossing point) optimizations and single point calculations with all interfaced methods. SHARC is an acronym for Surface Hopping including ARbitrary Couplings. Surface hopping is an extension of classical molecular dynamics to excited states. In surface hopping, the nuclei are treated classically and move according to Newton’s equations on the potential energy surface (PES) of one particular electronic state. Additionally, an electronic wavefunction is propagated using the time-dependent electronic Schrödinger equation, which incorporates non-adiabatic couplings (NACs) between the electronic states. Based on the electronic wavefunction, at each timestep a stochastic algorithm decides which PES the nuclei will follow. Events where a trajectory switches from one PES to another one are called “hops”, giving the method its name. In its basic form, surface hopping only includes NACs in order to determine when a hop should occur. SHARC extends surface hopping to include also other kinds of couplings beyond NAC. Two very important classes of additional couplings which can be included in SHARC are spin-orbit couplings (SOCs) and laser-dipole couplings (LDCs). This makes SHARC the perfect choice to study on the same footing many photophysical processes: absorption of light (mediated by LDCs), ultrafast IC after excitation (mediated by NACs) as well as ultrafast ISC (mediated by SOCs). 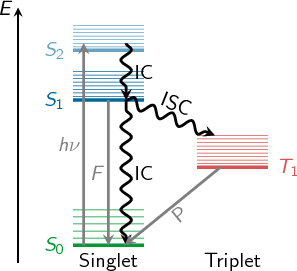 Jablonski diagram showing radiative photophysical processes (absorption (hν), fluorescence (F) and phosphorescence (P)) and non-radiative photophysical processes (internal conversion (IC) and intersystem crossing (ISC)). The theoretical description of these processes is important in photochemistry and photobiology. For example, many small molecules like O3 or SO2 exhibit efficient IC or ISC, which has important consequences in atmospheric and environmental chemistry. Similarly, IC is decisive in the first step of the biological process of visual perception and in the protection of the human body from UV radiation.